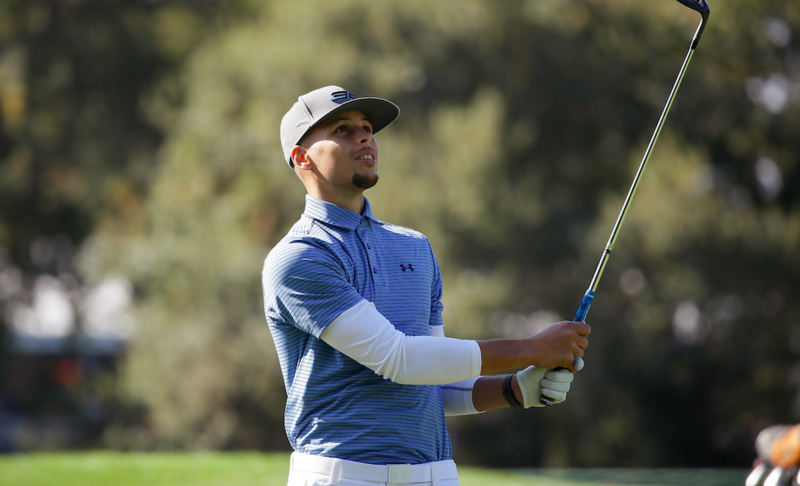 When two-time NBA MVP Steph Curry was offered an invite into the Ellie Mae Classic it created both buzz and controversy around the tournament. The idea of an NBA player dipping a toe into professional golf created a stir, but Steph is certainly not the only basketball player playing golf on a pro tour. If you look at the leaders in driving distance on the PGA TOUR, a majority of them have a deep background in basketball. Some of them you’re likely aware of, some might surprise you. The PGA TOUR has done their best to make sure that every golf fan knows that Dustin Johnson (ranked 1st in Driving Distance) can dunk. Gary Woodland (ranked 15th) attended Division II Washburn University on a basketball scholarship before transferring to Kansas to play golf. Andrew Loupe (5th) was an All-State player in Louisiana. Ryan Brehm (4th) lettered in basketball, earning MVP honors. Smylie Kaufman (20th) played on a state championship basketball team. Patrick Rodgers (tied 10th) and Tony Finau (tied 6th) played high school hoops (and have showed off their hops on Instagram). Brandon Hagy (2nd) played point guard through his freshman year. Bombers Trey Mullinax (8th), Kevin Tway (tied 6th) and Luke List (3rd) all played basketball extensively until they entered high school. In terms of raw physical tools, height is probably the most obvious advantage that basketball players have. Since basketball players are generally tall, it stands to reason that golfers who played competitive hoops would have above-average height. While height isn’t something that’s developed, it’s important to acknowledge that size is an important factor in these athletes being able to hit the ball so far. 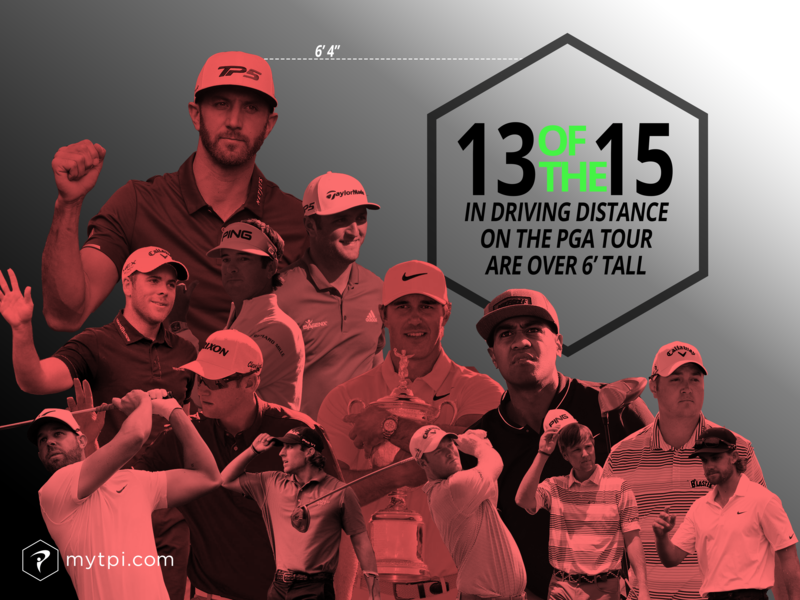 In fact, 13 of the 15 longest drivers on the PGA TOUR are 6’ or taller. As Dr. Rose explains in the video below, tall golfers have the potential to get their hands higher which 1) allows them more distance to accelerate the club and 2) decreases their moment of inertia, allowing them to turn faster. Anyone who is plugged into TPI is probably aware of that there is a strong relationship between club head speed and vertical jump ability. It's something we cover extensively in our advanced Fitness and Power courses. Vertical jump being a key factor in speed may be surprising to the uninitiated, but it’s clear when you analyze the 3D. TOUR players will drop their hips between 1 - 2” in the backswing and raise them 2 - 5” in the downswing. The vertical thrust helps shallow the club head, creating more optimal launch conditions (high angle, low spin) and, more importantly, the vertical thrust in the downswing creates tremendous ground reaction force which is a key source of power in the swing. Too many athletes - especially those directing their own training programs - get stuck training exclusively in the sagittal plan (up and down, forward and back). While some of our favorite exercises like squats and deadlifts are focused in the sagittal plane, it’s important for golfers to be able to move laterally (frontal plane) and, obviously, rotationally (transverse plane). Basketball is a dynamic sport that demands athleticism in multiple planes. Athletes develop a broad range of movement skills that serve them in other sports and activities. Basketball players are among the most explosive athletes in all of sports. Whether jumping, cutting or sprinting, basketball players tend to do it at full speed. In our junior golf programs, we advocate that young athletes perform these movements in their training. What’s even better than programming them, is developing them as a part of “play” in other sports (thought that’s not always the case, as Milo Bryant outlined in a recent article). The motion of a shot in basketball doesn’t look like a golf swing, but the development of body awareness and coordination transfers between both activities. After all, the core skill in both sports requires an athlete to direct energy into an object aimed at a goal. For example, the skill of making a free throw in basketball, requires an athlete to judge speed, control trajectory, impart the correct spin on the ball and produce the right energy required to move the object the correct distance with each attempt. Does that sound familiar? That is the same thing a golfer needs to sink a putt, make a chip or gauge a distance wedge. The case for the multi-sport athlete can sometimes be perceived as a chicken and egg conundrum. Did the athlete play multiple sports because they were the best? Or did the athlete become the best because they played multiple sports? The answer is probably somewhere in the middle. Some athletes were born with better physical tools, but all athletes have the chance to develop more robust tools through sampling as many sports and movements as possible. While Steph will likely not make the cut at the Ellie Mae, his background in basketball has been excellent preparation for success in golf. So, parents, if your kid is a standout golfer who wants to play hoops in the winter, encourage it, don’t discourage it. After all, they’d have something in common with some of the most powerful players in the world.